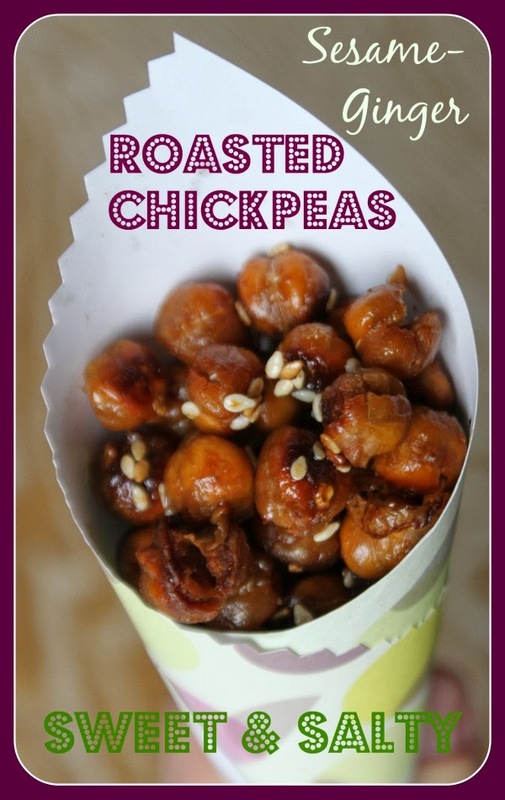 MamaEatsClean: Roasted Chickpeas - A New Addiction - Sweet and Savory - Ginger and Sesame! Roasted Chickpeas - A New Addiction - Sweet and Savory - Ginger and Sesame! Okay. Mama has a new addiction. Back in the day when I was doing the Paleo diet I wasn't eating any legumes. But then I went on the Candida diet. And on the Candida diet you can't have fruit or lots of the starchy vegetables. And I can't eat dairy. So I relied very heavily on nuts for snacks. I could get away with that because I was breastfeeding and training a ton. So I could use the calories. If you caught my Sunday post you might have read about how I'm starting to put weight back on. And thus I'm starting to realize maybe I won't be able to eat an unlimited amount of nuts on a daily basis. Darn are they convenient. Darn are they good. Darn are they high calorie. Darn is it easy to overdo it. And my options for other snacks are pretty limited. So I have been starting to experiment with chickpeas. If you follow me you'll know that I have been on a bit of a chocolate chickpea cookie binge. Still loving those. I decided to multi-task during my last (double) batch of cookies and roast some chickpeas at the same time. So in 45 minutes I had two batches of chocolate macaroon chickpea cookies (about 35) and a batch of roasted chickpeas. Gotta stock the fridge with snacks if I'm going to stick with this clean eating thing. Which I am finding hard these days - my hand keeps finding itself in the Halloween treats. I'm not impressed with myself, or my hands. They were super easy to make and super yummy. I think they would be pretty spectacular on my Asian Paleo Raw Salad. Next time since they are already gone. This is a pretty versatile recipe. The flavour combinations are endless. Just pick what you like and go for it. Next time I'm going to try cinnamon sugar(Truvia)! Drain and rinse chickpeas. To make sure they were fairly dry I put them out on a tea towel to dry and patted them a bit. Put in a shallow roasting pan lined with parchment paper. Bake for 30 minutes being sure to turn/rotate every 10 minutes. While the chickpeas are roasting combine dressing ingredients. Remove chickpeas from the oven and toss with dressing. I took them out of the roasting pan, tossed them in a glass bowl and then put them back in the roasting pan. Bake for an additional 10 - 15 minutes until slightly browned. Be careful you don't burn them.